The acronym PIDT means “troubled” in most North Indian languages. PIDT seeks to catalyze development of humane, sustainable and egalitarian societies. PIDT works to ameliorate social conditions of oppression and deprivation by increasing the capacities of people and the opportunities available to them so that they may design different futures for themselves. PIDT uses participatory planning and full engagement strategies, education,capacitation and reflective learning practices, triggering mechanisms of resistance inherent in people’s struggle for freedom, ensuring that they retain ownership of the development process, and kindling a desire for continuous growth and transformation. 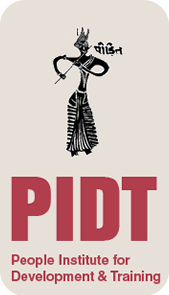 PIDT draws strength from approximately 50 full time professional and field staff, part time cadre members, and hundreds of based community volunteers who work with considerable autonomy under the overall mission guidance of the senior management team and Board of the organisation members to reach an underprivileged population of around 300,000 people. PIDT envisions and works to catalyze the creation of a humane society that is equality-based, oppression-free, resource-rich and ansformative, that is brought into being through the analytic understanding, decision-making, motivation, collective strength, and full participation of the ocially and economically oppressed themselves. Feminine values are frequently defined as fostering peace,collaboration, understanding, flexibility, prosperity, inclusiveness and cultural ontinuity. Without identifying these qualities exclusively with women, IDT seeks to strengthen such values in the full society to restore balance where patriarchal emphases on hierarchical structures and self-aggrandizement have led to violence, oppression and the depletion of critical human and natural resources. At the same time, by including women at the forefront of societal transformation and ensuring their ctive participation in both separate and integrated planning bodies, PIDT also aims explicitly to empower women. PIDT works to develop an environmental consciousness among the people and to promote eco-friendly lifestyles, herbal medicines, and agricultural production methods that are economically viable and sustainable. PIDT seeks to reawaken consciousness of lost values within society, to generate awareness of environmental, social, and gender issues, to encourage respect for cultural heritage through the retention of traditional skills and enterprises, and to reinvigorate holistic and community-based education toward the development of rightthinking citizenry, cognizant of their power to affect positive change in the world. An integral part of our mission is to draw out the insight that is generated through our experience working with the people and to link this knowledge with the persuaders of civic society to stimulate large-scale change, building bridges between people’s aspirations, actions and movements and developing understanding amongst different sections of the society.